Most people I know shy away from Google Plus, because its not the most popular social media platform. Although some recent stats from last year say Google Plus is gaining on Facebook. Why use it though? Its more information that will be indexed by Google, we all want to rank high in Google. It would only make sense to use their social media platform. Here is something interesting I just tried. I have setup dorrdirectory.wordpress.com and have it forwarding its post to Facebook, Twitter, and Google Plus. As I have described in some of my post regarding blogging automation. Within 3hrs my Google Plus page was ranked 2nd after my first post. 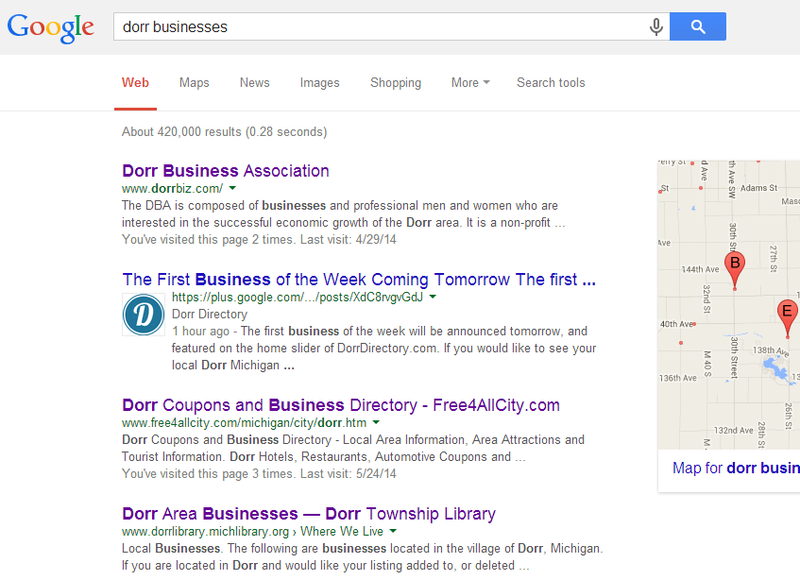 I know that traffic for “dorr businesses” is low. It more of the speed in which it happened. Also what got placed there, It was first posted on WordPress.com then WordPress re-posted it on Google Plus. Other than fact we know Google will rank its own stuff higher, I kinda thought the WordPress.com post would rank higher because that is where that post came from. So I recommend to use Google Plus if your promoting something, I would wait longer for the friends and family type of feel like Facebook. Black Hat SEO is a very interesting subject to me. In previous posts I have talked about automated blogging, which by it self really wouldn’t really be black hat. Black Hat SEO is most commonly defined as a disapproved practice that increases a page’s ranking in a search engine result page (SERP). These practices are against the search engine’s terms of service and can result in the site being banned from the search engine and affiliate sites. Making aliases and setting up several of these blogging networks, I am sure would be considered my most to be black hat. I just find it interesting if some one were to setup a lot of aliases and automate posts to dozens to of wordpress.com accounts that would trickle down to the social media platforms. Would this would be effective? Of the clients I work with I have rarely seen any back links from social media platforms show up in ahrefs. Or for that matter any other site or software for viewing back links. On occasion sometimes I will see a Google plus or Facebook, but rarely Twitter. Don’t get me wrong I know social media is very important for a website or for that matter a business. If not for the back linking, at least for the traffic that can be generated. However I have noticed that wordpress.com blogs are crawled allot and get indexed fast by google. It would be interesting to see if the same article was posted on dozens of WordPress blogs using some basic seo techniques, how they would rank.